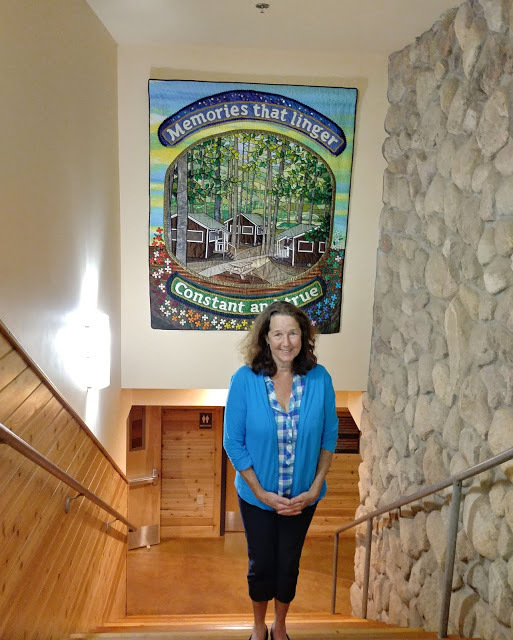 Annie, one of my oldest and dearest friends, and her sister Ellen commissioned me to make a wall-hanging for the newly renovated and expanded lodge at Camp Newaygo, in Newaygo County, Western Michigan, near where we grew up. Camp is very important and dear to Annie and Ellen–all the women and girls in their family for three generations have gone there. Thousands of girls who have attended since its founding in 1926 feel the same strong love and gratitude for camp as they do. 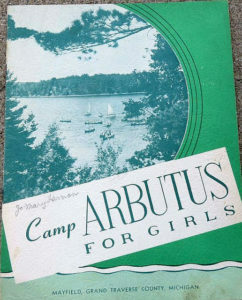 I myself went to a similar camp north of Newaygo, called Camp Arbutus. This cabin, Slide Inn, was my perch above the lake as a complicated 12 year old who found peace in the woods, and also as a much more complicated college-aged counselor at age 19. Until Annie and Ellen hired me for the commission, I was oblivious as to how this reinvention of Camp Newaygo was made possible. I certainly didn’t know how much it involved my own father. Nor did I anticipate how my old friendship with Annie would be reinvigorated with such beautiful love by this place and this project. When I was asked to make a wall hanging for the newly refurbished and expanded lodge at Camp Newaygo, the first thing I had to know was where it would hang. 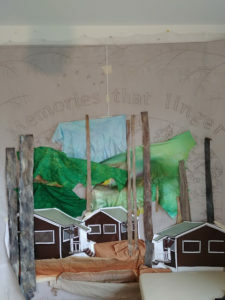 I love site specific design very much, and my design process was going to be based on the location of my piece. I traveled to Michigan and got to stay with my old friend Annie, and she took me to camp for a tour. Though I have years of happy camp memories from my youth, I had never been to Camp Newaygo. I needed some real time visuals, not wanting to work from someone else’s photos. I also knew that I wanted the focus to be a very iconic image from camp. The lakefront with the dock and all the canoes? A campfire? The path through their wetlands? All good but no….it had to be the cabins, the oldest ones there, built when the camp was founded in the late 1920s. When I think of the hundreds and hundreds of girls who have called these cabins home, in that special girl-power reality that is camp…all the friendships, the fun, the longing inherent in those adolescent years, (and the concomitant endearing and exquisite dramas)–and most of all, when I remember my own growth and happiness within the rustic outdoor world that made camp so special….I just knew this was my scene. I asked Anne and Ellen to choose a phrase that would be meaningful to everyone connected with camp. I like words on quilts. After what I am told was a serious and protracted family discussion, they chose a phrase from a favorite camp song, “Witchcraft”. We used to sing that same song at Camp Arbutus. Memories that linger/Constant and true was their most excellent choice. 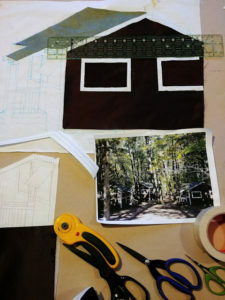 The focus, heart and soul of this project for Camp Newaygo is the grouping of these three old cabins. They are driving the entire piece, so I wanted to “build” them first. I was constantly referring to the printed photograph I am basing this composition upon, using that slick lighted magnifying glass to peer as closely as I could into the actual construction details, especially of the railings and the steps. I really want this to read properly. The eyes of my future viewers will catch anything false! The scarves you see in the picture have great significance at Camp Newaygo. Each color represents a specific group of campers, according to age. You are presented with your scarf when camp begins, and hand it on at the end of camp. The camp’s director gave me one of each scarf to incorporate into the quilt. When I asked what order they should be in, she made a spreadsheet!I made the colors overlap each other a little, to symbolize how a girl makes transitions as she grows up. I ironed the facings to the back and whip stitched them into place by hand. Luckily, my Dodgers are on a winning streak this June, so watching some games while I handstitched was great. No quilt is complete without its label. This one has a little story…. My friend Anne, who with her sister commissioned this quilt, sent me a shirt while I was working on the quilt. When we were 19 years old (over 40 years ago), I had snuck it out of her closet, embroidered it, and mailed it back to her for her birthday, which is in the fall. She wondered if I could include any of the embroidery in the quilt. I did include a bit of it in the label…and the fabric with the writing on it is from the shirt as well. The very final step was attaching cording to my finished edge. I wanted to add that final definition to my composition. 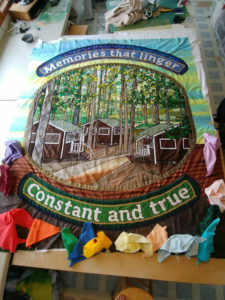 The quilt was installed and unveiled at Camp Newaygo last week. What a thrill that was! It was very moving for me, to see the quilt hanging in its forever home, looking like it had always been there. Every time campers or conferees or wedding guests (all people who use the lodge) go down the stairs to the rest rooms, they will see it! 😉 This space gets no direct sunlight so the quilt should hang there safely for many years. to welcome me when I’m returning home. But, in this real world there is no witchcraft and golden wishes do no grow on trees. Our fondest day dreams must be the magic that brings us back those golden memories. 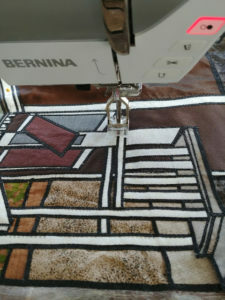 Allison Aller has been stitching, sewing, knitting, and writing since she was a child….and that child is alive and well in the joyful work she creates today in the field of crazy quilting and now, stained glass quilting too. Now she has turned her attention to stained glass quilts, with her new book, Allie Aller’s Stained Glass Quilts Reimagined: Fresh Techniques and Design. Her work has appeared in Quilters Newsletter Magazine, American Quilter, the $100,000 Quilt Challenge, Needlepoint Now, and the Way to Womens Wellness Art Bra Calendars (cover, 2007), as “guest artist” in several books, and in her own Allie Aller’s Crazy Quilting, C & T Publishing, 2011. Quilts…A Little Bit Crazy, co-authored with fellow crazy quilter Valerie Bothell, was published in May 2014.